Everything was coated in ice this morning. This is the first winter weather we have had this season – up until now it has been unusually mild. The garden seems to glimmer under the ice layer, everything looks cuddled and safe, but also fragile and exposed at the same time. During my wanderings I discovered all these oak leaves on the ground, much darker in color than the others. They look oxidized, almost blue. Immediately I start thinking about the dye pot - what color will they give in that condition? I have so much on my plate. Can I fit in a play date with the cauldron? 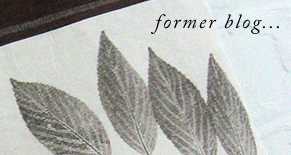 Do you remember my friend Lily's Japanese maple tree, and the beautiful prints made from its fresh summer leaves? Well Lily's maple continue to marvel. This time of year the leaves are turning a spectacular shade of red, slowly letting go, dancing towards the ground. Thankfully I gathered a few bagfulls of these treasures for some happy dye pot experiments. I am enthralled with the results. The cotton tunic started out ia drab, uncomplimentary beige color. Now it is covered in blue, green, and gold maple leaf imprints. I can't wait to wear it with my favorite pair of jeans! The eco-prints on silk are equally amazing. I especially love the effect on the thin organza, shown at the top of this post. A mere whisper of impressions, still clear and powerful held up against a white background. Magical.